Our BEST MX5 Sways! These Front and Rear PROGRESS MX5 Miata sway bars were developed on our own Forum 2012 PRHT Project Car! A perfect match for our Progress Springs to make your MX5 corner flat and stable through the most challenging turns! BRIAN'S APPLICATION NOTES. These are SERIOUS! We had a number of customers wanting something more serious than our 1 inch front bar choices, more like the Hotchkis but without the $400+ price tag. So, we worked with Progress for more than a year on development, using our own 2012 PRHT as the development car. The resulting bars are a little stiffer than most choices (a little stiffer than our popular Racing Beat sways). My wife just loves the combination in our 2012, the car is wonderfully flat and stable...and a blast to drive on freeway on-ramps and mountain roads! These bars are finished off MUCH nicer than most choices, in some ways that will not be obvious from the little photos. 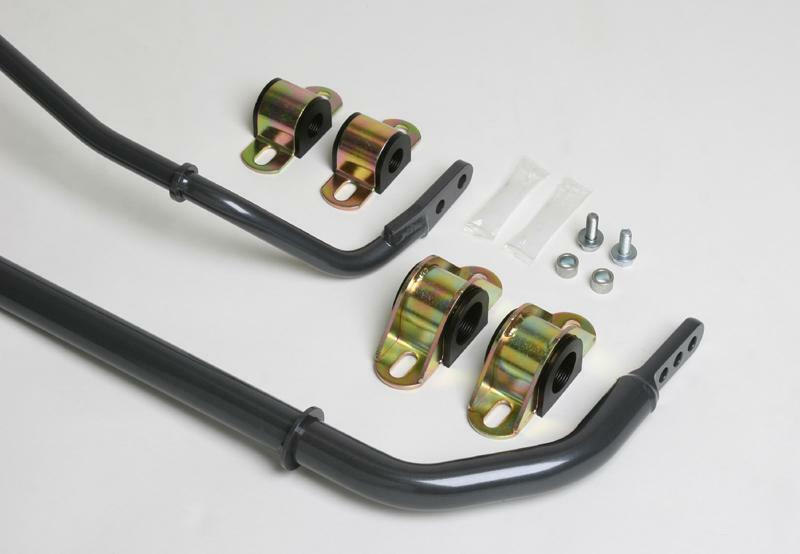 One aspect of the higher quality in these bars is the brackets, which are MUCH more stout than the mounting bracket of any other sway bar choice we offer. The Brackets are heavily gusseted and WIDER to prevent flex and to give the wider bushings more coverage of the bar. Let's look at a picture of the Front Fully Gusseted and Cadmium plated Progress MX5 Sway Bar Brackets! Think about the effect of those WIDER brackets! The extra width in the bracket means less stress for the bushings, which results in more longevity and consistency for many years of fun driving. Now let's look at the rear brackets. Many of our other choices supply just a new bushing for the rear that has a bigger hole in it for the bigger bar and you recycle the factory tin brackets. That is a very efficient choice and helps keep cost low, but those thin tin factory rear brackets are just 'okay' and can easily be improved upon. Progress supplies rear brackets that are quite a bit more heavy duty than the factory. Thus, these bars are just a notch more serious than our Racing Beat or Hotchkis or Eibach or any other MX5 Sways we sell. Note that both these bracket decisions make install slightly more involved. The fit of these beefier brackets front and rear is tighter than the stock brackets, and Progress supplies a spacer for the front that lifts the ABS bracket above the sway bar bracket because the bracket is so much wider that it would not otherwise install. These are small prices to pay for the extra stoutness and long term reliability of the installed result. NOTE on Settings. My wife's 2012 has the bars set to middle position in the front, and tightest position rear. At that setting (and with our Progress Springs), I can throttle steer the car comfortably and it is a blast to slide around tight turns, but with those settings the car can be spun and my wife has spun it a few times at autocross events when really pushing much harder than folks should in the real world. Thus, I strongly caution and suggest a more forgiving starting position such as middle or tightest position front (tightest is closest to center of bar) and the less tight rear setting (hole nearest bar ends) until you have some experience with the setup under controlled circumstances (such as an autocross event). Was nervous ordering these as I have always used Hotchkis or Eibach on past cars. So far Good-Win has been a good place for advice so I rolled teh dice and ordered a set.... and wow they are everything they claim. I set the front full stiff and the rear on soft and they handle great! Very happy with this purchase! Can't wait for Sat's AutoX to test them on track. Very best sway with the fair budget. I can't say it the best one, because I didn't have other modes but you won't chose wrong for progress F/R sway. It a way better than the stock weak sway bar. Trust the reviews here, it will help you to save your time and budgets. The difference between these and the stock sways is night and day. When I first installed these sways I had the factory sports package Bilsteins installed, the front sways set to medium (middle hole), and the rear sways set to the light setting (hole farthest from the bar). If I was looking for a spirited daily driver or weekend canyon carver I would have stayed with that setup. But I'm working towards an aggressive daily driver, so I installed the Tokico adjustable shocks and Progress lowering springs, the combo of those two with the Progress sways, paired with some chunky tires (235/40 17) has given me, what seems like endless grip! Rear installation took about 20 min, pay attention to orientation. Front installation took approx 2.5 hours, there is a lot of components in the way. All and all these sways are a must have, and will bring out the best of your NC. First installed the rear bar by itself - I hadn't planned on it but I was installing the SuperQ muffler and since I had that out and the rear bar was completely exposed I decided to go ahead and do it too. With stock springs and rear sway soft position, it is almost perfect! During AutoX it causes it to over steer a bit but is completely controllable and that is much preferable to the stock under steer. I was actually pretty happy with just the rear bar installed but wanted to try with the front bar installed and rear set to stiffer position. The front sway bar makes a HUGE difference! The car now has very little body roll now. I can go through a local turn that I previously felt comfortable at 50 MPH now at 55 MPH. That's a huge improvement. However now for AutoX it is back to under steer but much less than stock. I have the front on the lowest setting and the rear on the stiffest. Only thing I can think is that the bars are intended to be used with the Progress springs (which I plan to purchase next). The Progress springs increase the rate in the rear (22%) more than the front (14.5%) and that should make the balance better. I can STRONGLY recommend these bars! Quality is Awesome! Handling is out of this world! I was replacing the front shocks with coilovers so installing the front sway bar was a breeze with the front shocks out of the way. Installed in January of 2016. Stock suspension otherwise, stock end links. Car sees track time, and sway bar was purchased at the same time as I picked up r-spec tires and new wheels. Install for the front bar was a pain but I expected that. Took about 2 hours. Nearly all of that time was spent removing and replacing trim around the wheel wells. Once the trim was off, though, removing the stock bar and putting the new bar into place was super easy. I used the FlyinMiata instructions for their sway to dismantle the trim. Make sure you have a stubby phillips screwdriver. Car feels totally different, though I have not yet taken it to the track. In the canyons, the car has near zero body roll. It feels more like a stiff sports car. Very confidence-inspiring; should be great at the track. Only complaint is that the Progress bar sort of works too well. The zany roller-coaster feeling of the car moving around in corners at 15mph is all gone. This is a serious bar for track use. If my car was street only, I might have left it well alone, or gone with something less like the RB. When purchasing these sway bars, coupled with the Racing Beat Endlinks, I was a little skeptical on just how much difference it would make. Needless to say any doubts I had were quickly dismissed after install. I set the front sway to middle setting and the rear to soft. and the difference was immediately evident. The car felt more planted, and confident on turns than ever before.